Nowadays everyone is so concerned about one's Health and start on a diet without much interest and it finally leads to an outburst one day and we start eating more than normal. Junk foods (fried foods) are to be avoided normally but if we start avoiding these at home the week ends would end up in KFC, Mc Donalds, Pizza etc. If we prepare this at home, sometimes we will not able to match the taste but we can use fresh oil to make this fried items and stay healthy. Once in a while by preparing this feast at home it becomes a real treat for the family members. I have used Thyme in this recipe for flavour. You can use any herb of your choice or can use mix of some herbs also. Add garam masala if you do not have any herbs at home.You can use chicken with skin pieces also to make it more crunchy and crispy than this.This is an easy to make tasty burger. Try this at home, your kids are also going to love this. Then cut each slices into three pieces. So will get totally 6-8 pieces. Marinate the chicken using chilli powder, ginger garlic paste, thyme/garam masala, lemon and salt for 10-15 mts. You can continue if you are running out of time. In a flat plate add flour and corn flour and pinch of salt and mix well. Another bowl add egg (and little milk if you like) and beat well using spoon . Take a piece of chicken and dust in the flour mix and then dip in the egg then again coat the chicken with the flour mixture. Again dip the chicken in egg mixture followed by flour. Likewise do for all chicken pieces twice and shake off the excess flour from the pieces before frying. Heat the oil well and deep fry the pieces till crispy and golden colour appears. 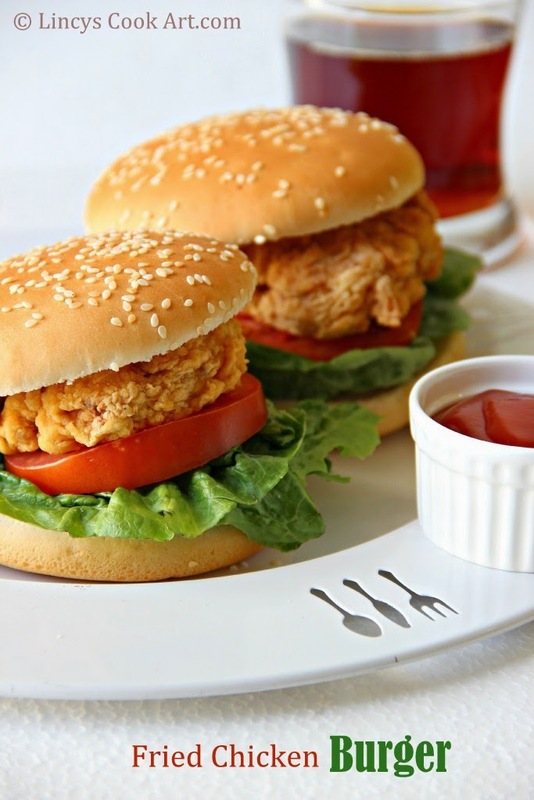 Cut the burger buns into two and keep the lettuce, tomato slice, then fried chicken keep mayonnaise, tomato ketchup, chilli sauce, mustard sauce as you prefer. Cover with the top piece of bun and serve hot. Omg, how irresistible they are, you are making me crave for some burger at midnite..
Macdonald will be out of business soon by looking at this. All time favorite!! Well done!! These burgers are looking wonderful. soo inviting. Irresistible chicken burger .Great job!! looks so yumm.drooling over the pics....looks better than restaurant any time...very well presented ..
oh wonderful burgers with matching pictures.hmm now my husband wants me to make it home haha .